BACK TO WHERE THEY BELONG. A total of 115 sea turtle hatchlings made their way to the sea on March 29, 2019 from the shoreline of a coal-fired power plant. TSI named this batch of sea turtle hatchlings ‘Team Stingray’ after Davao City Mayor Sara Duterte-Carpio’s son, whose birthday is on the same day the turtles were released. Since the discovery of the nests, TSI has worked with various groups, including the team from the group’s pawikan conservatory in Aboitiz Cleanergy Park in Punta Dumalag, to ensure that the nests inside are well-protected and well-cared for. 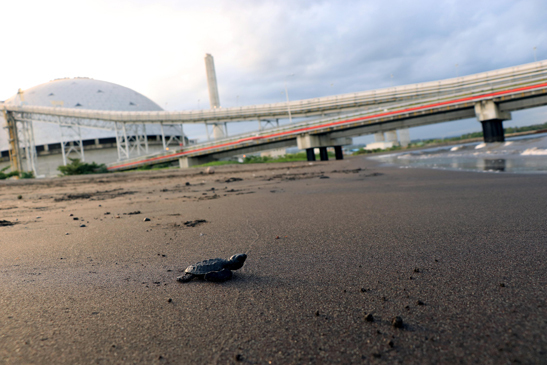 The sea turtle hatchlings released on March 29 emerged from an undiscovered third nest along the shore of the coal-fired power plant. TSI named this batch of sea turtle hatchlings “Team Stingray” after Davao City Mayor Sara Duterte-Carpio’s son, whose birthday falls on the same day the hatchlings returned to the sea. "This occurrence reinforces the diversity of our marine ecosystem in the city. Having a coal-fired power plant playing host to these hatchlings makes this event even more interesting,” Duterte-Carpio said. “The hatching of the pawikans has been an eye-opening experience. It is a small indicator that our environmental stewardship efforts are bearing fruit. The presence of these endangered creatures inside the plant is proof of sustainable environmental conditions resulting from the steps we have taken to operate our power plants responsibly,” said Danel Aboitiz, president and Chief Operating Officer of the Aboitiz Power-Coal Business Unit. Sea turtles come back to the place where they hatch through their magnetic imprinting. When the released hatchlings grow up, they may come back to the area to lay new nests and repeat the cycle. Because of this, TSI plans to engage the community and experts to ensure that the shorelines remain pristine and conducive for pawikan nesting in the years to come.